Be ready for any field or gym sport in our women’s jerseys. Find jerseys with contrast piping and panels to highlight your team colors, and enjoy the high-performance fabrics and features. Unite with your fellow athletes or cheer on the home team by using our custom embroidery and screen printing services. Your message will be seen from across the stadium! Monday - Friday 9am-5pm EST. 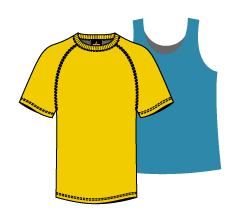 ClothingWarehouse.com is a service mark of Clothing Warehouse, LLC. © 1998-2017. All rights reserved.